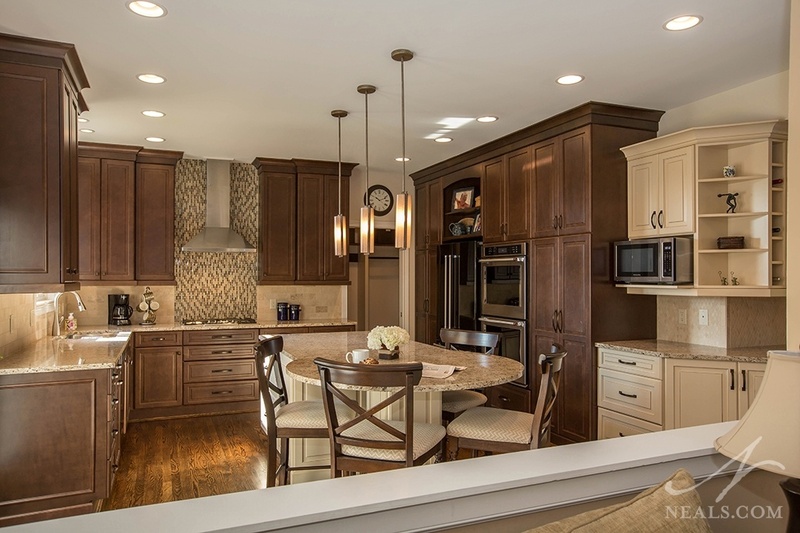 In kitchen design, the backsplash provides an opportunity to inject added style and character into the space. 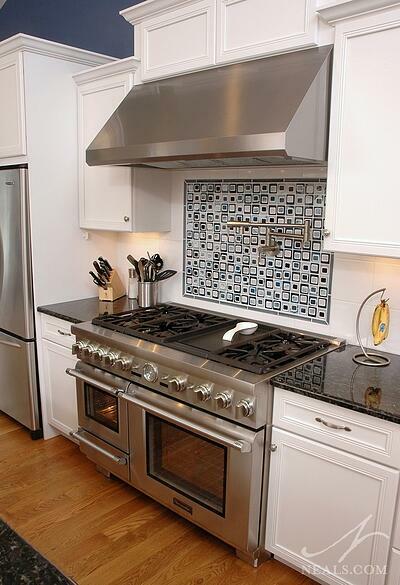 Often times, a simple backsplash in a classic, time-tested style does the trick effectively. 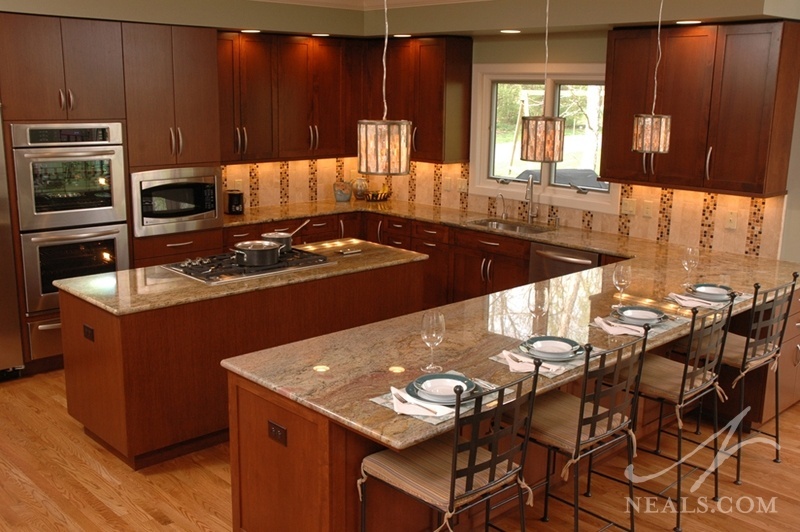 Other times, homeowners are interested in a backsplash with a bit more visual impact. 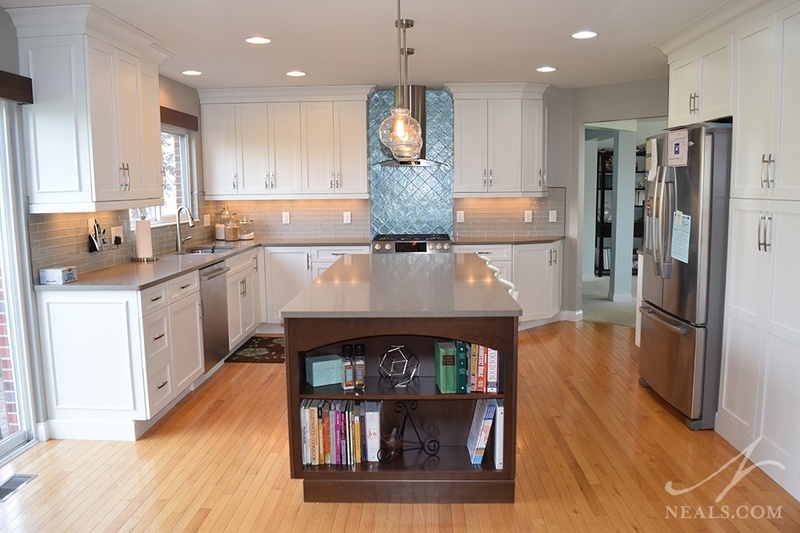 Keep reading for 5 things to consider for a show-stopping backsplash in your kitchen. Iridescent blue tile behind the range in this Lebanon kitchen creates a focal point that changes character as the light changes. One easy way to add an eye-catching focal point with your backsplash is to look for colors or materials (or both) that contrast against the rest of the finished in a harmonious way. The point isn't to create a sharp juxtaposition or something garish for the sake of shock value. Instead, look for colors that aren't already used elsewhere in the design of the room, but are still complimentary. The natural variations of handmade tiles work well for creating a color statement that stands out on the wall, as would a richly-hued glass tile. Consider the way the color changes with different lighting schemes. If the tile has an iridescent or pearlized coating, as the day progresses, the tiles will change in appearance, creating a dynamic installation. The slightly quirky pattern of this blue and white backsplash detail is a fun inclusion that stands out in this white Blue Ash kitchen. Kitchens are, for the most part, fairly rigid in their lines. 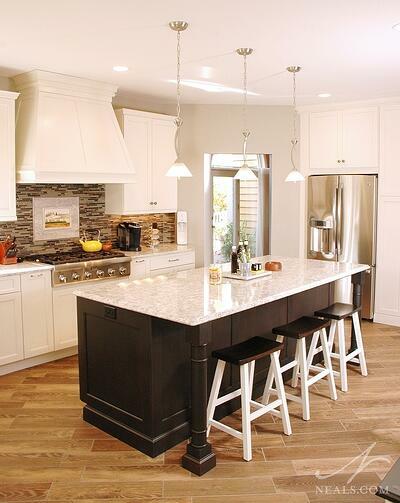 Rectangles of cabinetry and expanses of flat work surfaces create the foundation of the space. Introducing a distinct and different pattern into the backsplash is a way of going against the grain of the kitchen's intrinsic lines. This can be achieved either by using unique tile shapes (such as the grid of nested tiles above), using color mixes to create an interesting feature for the eye to be drawn toward, or using a material with a lot of movement and interest, such as the granite slab below. Whichever way you go, the key is to inject a different type of pattern than the surrounding kitchen so the eye can distinguish that something is going on, and is interested in taking a look. 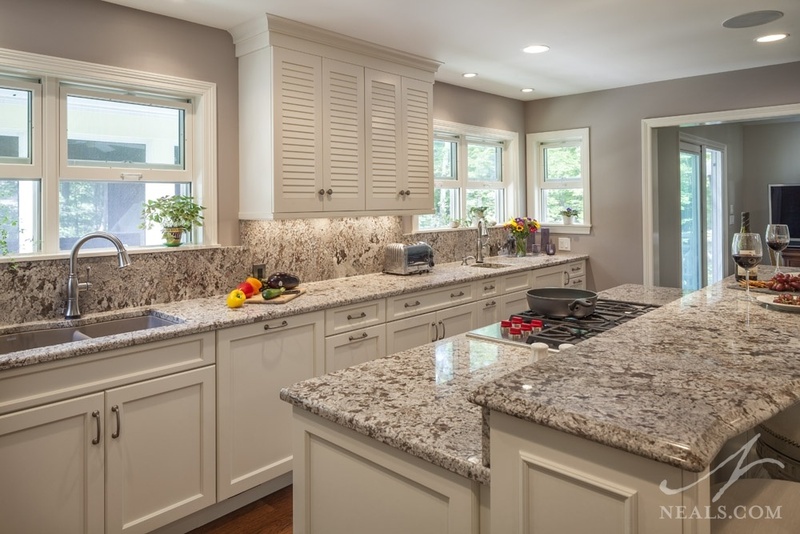 The sand-toned granite in this Sycamore Township kitchen was installed as a slab backsplash, and carries the interesting pattern upward. Pattern can go hand-in hand with another factor that creates a "wow" backsplash- scale. This can mean a few things. You could play with the size of tiles by either going for very small tiles or very large ones. Or the scale could also relate to the scale of the backsplash on the wall in the kitchen. Does is ride low or extend up the ceiling, such as the small glass mosaic tile does in the kitchen below? The tiny, mixed-color glass tiles behind the cooktop in this Mason kitchen uses the full height of the available space to create impact through the scale of how much space they take up. Often times when traveling, homeowners will find special tiles that stand out and speak to them. Or there may be a hand-painted tile that comes to you by way of an heirloom or gift. Maybe it's just a very special artistic tile you came across online and love it. All of these offer a chance to create a show-stopping backsplash simply by dint of being distinctive. In these cases, a regular field tile can be used that matches or compliments the unique pieces so that the art of the tile stands out even more. The hand-painted tile featured in the backsplash in this Anderson Township kitchen was found on a vacation to Italy. Finally, creating a backsplash with a lot of visual impact in your kitchen may be as simple as changing the rules of a normal installation. Does the material you've selected have a normal, traditional or typical pattern or layout? Think about what might happen if you rotated that, or added elements of variety that wouldn't normally be used (such as color, pattern or scale). What if you used a field tile as an accent, and an accent as a field? This doesn't require going crazy or creating some kind of "fun house" look. You can still use time-tested materials in neutral or understated colors, but by installing them on the wall in a way that is different from the expected, you create the kind of visual tension that creates a show-stopping feature. Small glass mosaic tiles in a vertical stripe pattern in this Sharonville kitchen is a deviation from a traditional installation that brings interesting character to the backsplash.